Blinds, Shutters, and Shades: Which is the Best Style for Your Plantation, FL Property? If you are looking for a fast way to improve your Plantation, FL home, then you need to consider the benefits of new window coverings. These products impact the appearance of the property. At the same time, there are many functional benefits available as well. But, it is important that you talk to an experienced installation team for assistance. We can help you compare the pros and cons of the popular designs: shutters, blinds, and shades. Our team at Open House Interiors is focused on your satisfaction. We know that many products might work in your home. Instead of choosing cheap products, our goal is to help you select the window coverings that will make your property look great. We offer a balance of affordability and quality to protect your budget and maximize your results. Is there are specific design or style that you want in your home? Let us know your preferences, and we will help you find the products to match. You can customize your window coverings to create the home of your dreams. Blinds are usually the cheapest solution if you are on a tight budget. But, other high-quality blinds have better durability and style. Just because you are getting a great price, doesn’t mean that you will need to sacrifice the quality of your new blinds. We will help you source materials that will hold up for many years, and reduce your expenses at the same time. Consider the size, color, and features that need to be incorporated into your blinds to create the style that you prefer. For example, you can choose from different materials and slat sizes. We always offer custom manufacturing to ensure that the blinds fit your windows perfectly. Most blind designs use horizontal slats with cords that connect the slats. But, there are a few styles that use vertical slats instead. You can pull on the cord to move the angle of the slats and open the window as desired. When the slats are closed, they will cover the surface of the glass completely, so no one will be able to see inside. Shutters are another design that uses slats to cover the windows. Instead of connecting the slats to a cord, shutters have a wooden rod that runs down the center of the slats. You can move the slats by pushing the rod up or down. One drawback to shutters is that they need to swing open if you want to expose a window without any partial blocking by the window coverings. But, the upgraded style of shutters creates a luxurious, beautiful environment for your home. Shutters are among some of the more expensive products in the industry. They are sought-after by homeowners who are looking to create the best homes for their families. You won’t go wrong by installing high-quality shutters in your home. You can see different examples of shutters in our showroom. Compare interior shutters and plantation styles. Also, look at the various materials, colors, and features that can be used to highlight your windows. The final option is to skip the slats and have window shades installed in your home. These products use fabric that covers the surface of the window. Usually, shades are designed with a rod that wraps up the fabric when you want to expose the window. Another option is to use shades that have pleated material that gathers together when the window coverings are open. 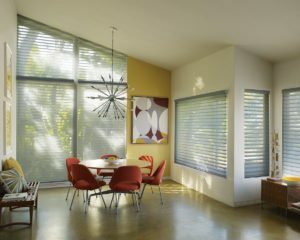 Homeowners love the stylistic benefits that come from window shades. You can choose the fabric colors and patterns that will highlight your home and contribute to the overall décor of the property. These products are beautiful, and they add the functional benefits as well. The most important decision that you can make is to choose a window covering team that you can trust. The reputation of your installation team will affect the products that you are buying. Choosing a company with a good reputation means that you will have the peace of mind to know that you will receive top-notch materials. Here at Open House Interiors, we are working to provide the best services in the area. You are always welcome to contact our company if you have questions about the products that we offer. We are focused on quality and customer service, giving you the top-notch results that you desire.